By TLex Here's a sneak peek at a new diver from HAMILTON called the Khaki Navy Sub Auto Chrono. The watch will be officially released at Basel later this week. We haven't seen a new Hammy diver in quite some time, so expectations are fairly high. I will wait for more detailed images before passing judgment, though. Basic spec. 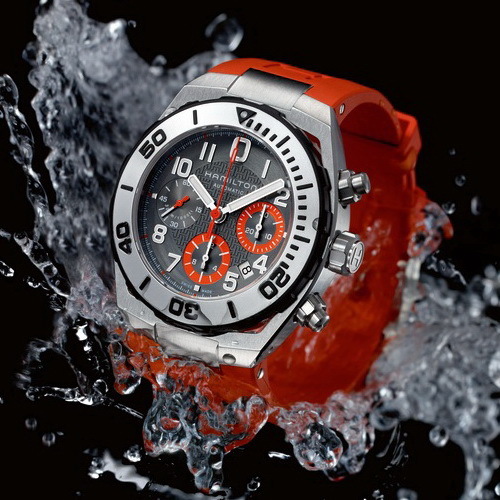 includes: a 43mm brushed and polished Stainless steel case with rubber details on the bezel, a Sapphire crystal with anti-reflective coating, screwdown pushers and crowns and a water-resistance of 30 bar, 300m. The dial is in black and gray with an 'H' pattern in the center and applied indices with Super-LumiNova®. It is powered by an H-31 automatic chronograph caliber with up to 60 hours power reserve. RRP is 1995USD / 1595€ / 1995CHF.